Also known as a T-bone or broadside crash, side-impact collisions occur when a vehicle is struck in a side panel, typically by another car approaching from a sideways direction. These accidents can be extremely dangerous due to the lack of safety structures in the doors, and the proximity of the occupants bodies to the point of impact. Data from the United States Office of Health, Safety and Security reflect approximately 9,000 fatalities every year from T-bone collisions, while South Carolina saw 828 traffic fatalities across the state in 2011, many of which can be attributed to the broadside crash. While rear and side airbags can sometimes protect passengers from the dangers of this type of crash, only a small percent of vehicles are equipped with them, and there is no guarantee that they will deploy in time to save a life. 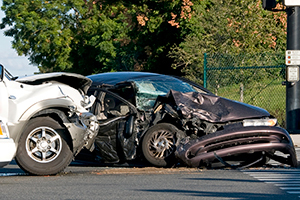 Have you or someone you love been injured in a side impact crash? If so, the hurt and frustration you are experiencing may be due to the negligence of another driver and you could be eligible for compensation because of the pain and suffering you endured. The experienced lawyers at Harbin & Burnett have extensive experience negotiating and litigating broadside accident cases, and we will always fight for you to get every dollar you deserve in the minimum time possible. To find out how we can help, simply fill out the Free Case Evaluation form located on the upper, right-hand-side of this page. There is no obligation to proceed and the details of your case will always remain strictly confidential it is 100% FREE. Vehicles are equipped with crumple zones to absorb some of the force of a collision. In the event of an accident, the car body will crush in specific areas in order to avoid damage to the areas where occupants are seated. However, in a T-bone collision, the force is absorbed by the side panels, which are not created to withstand the kinetic energy of an oncoming vehicle. In some cases, the impact of the crash will turn the vehicles to face another direction, or cause them to spin out of control. It is important to get any vehicle occupants out of the way of traffic as soon as possible, since many of broadside collisions take place at intersections or other areas of densely packed traffic. The first priority after a crash is always to ensure the safety of yourself and your passengers and to get out of harms way as soon as possible. However, if another drivers negligence caused the accident it is critical you get contact and insurance information so the accident does not become a hit-and-run, leaving you and your loved ones with very little recourse for your pain and suffering. If you or a loved one has been involved in a side-impact collision caused by a careless driver and the victim is seeking legal counsel, our attorneys are here to help. At Harbin & Burnett we are dedicated to helping personal injury victims fight for the compensation they deserve.